Prophet Muhammad set up principles based on the Quran to create an order in social life. A few of these principles include the brotherhood of all Muslims, helping one another and solidarity amongst people as well as putting up a shared stand against injustice. Along with these, there are other practical examples that the Prophet modelled himself and encouraged all Muslims to emulate. Some of these are equal treatment of all Muslims regardless of whether they are advantaged or disadvantaged, rich or poor, materialization of a Muslim brotherhood between Ansar and Muhajir as an institution of mutual solidarity and continued support, encouragement for helping each other, exchanging gifts and spreading salam (saying ‘peace be upon you'). All of these measures and principles are geared towards the creation of a generally harmonized and peaceful society. One's family and relatives who make up his/her immediate environment have special importance within this framework. Tribal prejudice in the pre-islamic Arab society gave rise to a spirit of tribal loyalty in the form of strong relations amongst people from the same tribe and branch. This was however the reason for serious tribal wars and rivalry. Within such a context, the exemplary relationships that Prophet Muhammad had with his tribe and family helped put aside the inner rivalry fired by tribal prejudice and created a sound and legitimate framework of relationships among family and relatives. The relationship of Allah's Apostle with his family and relatives can be formulated as his relationships with his Ahl ul Bayt ('People of the House', connoting the Prophet's family members and their early descendents). For the evidence in the Quran, the ahadith (Traditions and doings) of the Prophet and the literal meaning of the expression of Ahl ul Bayt in the Arab language point out to the fact that Ahl ul Bayt involves both family and relatives. It is accepted that, in the strict sense of the word, the expression refers to the Prophet's wives, children, Hadhrat (the noble) Ali and the Prophet's grandchildren Hadhrat Hasan and Hussain, and in a larger sense, it includes all of his direct descendents who are muslims. Prophet Muhammad's (peace be upon him) married life started with hazrat Khadija and continued with his other marriages. It was said that at the time of his death, he had nine wives. Six of the Prophet's wives were from Quraish. These are Hadhrat Khadija, Aisha, Hafsah, Umm Habibah, Umm Salamah and Sawdah. His other wives from non-Quraysh Arabs were Hadhrat Zaynab bint Jahsh, Maymunah bint Kharis, Zaynab bint Khuzaymah, Juwayriyyah bint Kharis. And his non-Arab wives were Safiyyah bint Huyay and Mariyyah al-Qiptiyyah, both from the tribe of Banu Nadir. Two of Prophet's wives who died while he was alive were Hadhrat Khadija and Zaynab bint Huzaymah. Our Prophet's family life was shaped around islamic principles and he implemented in his own life the principles he preached to his ummah. The following advice of the Prophet for ensuring peace and happiness in the family both in this world and in the hereafter gives us the fundamentals of peace and happiness: "The best among you are those who behave best toward their wives. I am the best among you toward his wives. The best among you is the one who is the kindest to his wife and the worst among you is the one who treats his wife badly." All of the Prophet's children, except for Ibrahim, were from Hadhrat Khadija. They were Qasim, Abdallah, Zaynab, Ruqiyyah, Umm Kolsoum and Fatimah. Other son of the Prophet, Ibrahim, was from Mariyyah who was sent to him as a gift from Muqavqis. Although his sons died when they were quite young, his daughters grew up and got married. The marriages of Prophet Muhammad, sal Allahu alayhi wa Salaam, which involved a multitude of situations and aspects, were models for muslims in all respects. While his marriage to Khadija introduces to us an example of monogamous life, his other marriages brings up a rich variety of his attitudes towards his different wives each with a different personality. The first point to be made about these relationships is the commitment of spouses to each other on the principle of honesty and loyalty. We can find numerous examples of honesty and loyalty between the Prophet and his wives on which they built a happy and peaceful family life. The first example of great loyalty in the family life of the Prophet is the commitment of Khadija, whom he married after their acquaintance through business. Khadija was always there to support him spiritually and financially both before and after his prophethood. When he first received divine revelation, Prophet Muhammad was frightened and worried and the first thing he did was to go to Khadija and tell her about the his situation. Khadija reminded him of his good virtues and told him ‘By Allah, Allah will never disgrace you.' and she relieved him by explaining to him that he was visited by an angel and that he was a prophet. Another example of loyalty and commitment between Allah's Apostle and his wives was the freedom he gave to his wives on the basis of divine command to choose between him or worldly benefits when they asked from him for material things, at the end of which, they always chose Allah, His Apostle and the life of the Hereafter. In return for his wives' loyalty and commitment to him, Prophet Muhammad always observed their rights. The truth of the matter is that observing the rights of one's spouse is a principle set by the Quran itself, which can be seen in the following verse: "...And they (women) have rights similar to those (of men) in kindness..." Examples to the Prophet's careful observation of the rights of his wives are plenty. For instance, he would draw lots among his wives before he would go on an expedition and each time he would take one of them with him by turns. Again, he would allow a day and a night for each of them. Although in many hadith reports he was said to have more affection for Aisha, this never led him to treat his wives unequally or unfairly. As a matter of fact, he signified the importance of this matter, examples of which he practiced in his own life as a model for all the muslims, within the framework of the basic principles he preached in his Last Khutba (sermon): "O People, it is true that you have certain rights with regard to your women, but they also have rights over you. Remember that you have taken them as your wives only under ALLAH's trust and with HIS permission. If they abide by your right then to them belongs the right to be fed and clothed in kindness. Do treat your women well and be kind to them for they are your partners and committed helpers." Once asked by one of his companions about the rights of wives over their husbands, he said: "That you should give her food when you eat, clothe her when you clothe yourself, do not strike her on the face, do not revile her or separate yourself from her except in the house." Likewise, all the wives of Prophet Muhammad observed his rights over them both as a husband and a Prophet and they acted with care and respect when it came to protecting his prophetic attributes. Once Abu Sufyan, who was the chief of the Meccan polytheists, came to Madinah to request an extension of the duration of the Hudaybiyyah Agreement. When he saw that he was not quite welcome by people, he thought he could go to his daughter, Umm Habibah and ask for her help. When he entered the house of her daughter, he wanted to sit on the cushion of Allah's Apostle, but her daughter did not allow him. Abu Sufyan asked her, ‘Oh daughter! Am I better than this seat, or is it better than me?' She said: ‘You are a polytheist and you are impure. That's why you can not sit on the bench of Allah's Apostle.' Her answer was an open manifestation of her utmost sensitivity. "The most perfect Muslim in the matter of faith is someone who has excellent behavior; and the best among you are those who behave best toward their wives." What is also integral to happiness and peace in family life is love and respect between spouses, which finds its expressions in many of the Prophet's ahadith and in actual examples from his life. In a hadith, he says: "The most perfect Muslim in the matter of faith is someone who has excellent behavior; and the best among you are those who behave best toward their wives". Also, other ahadith like,"A believing man should not hate a believing woman; if he dislikes one of her characteristics, he will be pleased with another" and "I advise you to treat your wives well" are all commands to foster love and respect between spouses. Prophet Muhammad never forgot the sacrifices Hadhrat Khadija made and the respect she had for him and he always cherished her memory with love and respect. Once when he talked about her, Aisha told him, ‘Why do you keep talking about that old woman? Allah gave you better ones than her.' Allah's Apostle got upset at her remark and replied: ‘"Allah has not given me a better one. She believed in me when no one else did; she accepted Islam when people rejected me; and she helped and comforted me when there was noone else to lend me a helping hand. She used her property for me when noone gave me anything and she gave me children when noone gave me children. ". On the other hand, when asked about who was dearest to him, Allah's Apostle said ‘Aisha' from among women and ‘her father' from among men, which is a clear expression of his love and respect for his wives. We can see that, along with tolerance and sacrifice, solidarity and support in good and bad times play an important part in Prophet Muhammad's relationships with members of his family. He always welcomed their appropriate wishes and actions and helped them. Once Hadhrat Aisha wanted to watch the sword show of a team from Habesh in the yard of the mosque, the Prophet accepted her request and waited till the end of the show. When Safiyyah, whom the Prophet wed after the conquest of Khaybar came to Madinah, Aisha went to visit her. On her return from the visit, the Prophet asked her how she found Safiyyah and Aisha said, ‘Just like a Jewish girl.' The Prophet did not get angry with this answer given for some personal reasons and also as a reaction to the beauty of Safiyyah, he only said, 'O Aisha, don't say that, she accepted Islam and how beautiful her Islam is.' to correct her. Members of Prophet Muhammad's family were his greatest helpers in the face of hardships. We could find in their lives the peaks of solidarity. The year the Hudaybiyyah Agreement was made, muslims intended to make umra (a visit to the Kaba'a), wore their ihram (to be clothed in two seamless sheets to perform Hajj or Umra) and prepared to sacrifice animals. In spite of all these preparations, the polytheists did not allow Muslims in Mecca and made an agreement with the Prophet. The agreement not only involved some articles that were not in favor of the muslims but it also stopped them from making umra that year. When this agreement was signed, the Muslims got very upset and had difficulty accepting its conditions. Although the Prophet told them three times: "Get on your feet, sacrifice your animals, shave and take off your ihram." noone was willing to do anything. He became very upset and went to his wife, Umm Salamah, who was with him at that time, and told her about the situation. 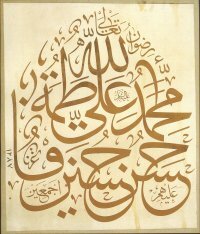 Safiyyah answeed: "O Allah's Apostle! Go out, sacrifice your animal without talking to anyone, then call someone, let him shave you and take off your ihram." The Prophet did as she told and took off his ihram. Then his companions did the same when they saw what he did although they were a bit half-hearted. This incident shows us how Umm Salamah saw how the companions of the Prophet did not want to obey him because of their unhappiness with the situation and also their hatred of the polytheists and how this left the Prophet upset and in despair. The advice she gave at such a critical moment both helped the companions to obey the word of the Prophet and to relieve the Prophet's burden. Another distinctive attribute of the family of the Prophet was their patience and contentment in the face of material depravity. While some of the Prophet's wives were poor, some of them were from rich families. All of them, however, by wedding with the Prophet renounced any prospect of material prosperity and exemplified a greater patience. Aisha narrates, "A complete month would pass by during which we would not make a fire (for cooking), and our food used to be only dates and water unless we were given a present of some meat." Again, in another report of hadith, she says: "The family of Muhammad had never eaten their fill of wheat bread for three successive days since they had migrated to Medina till the death of the Prophet. ". These are all exemplary expressions of altruism and patience. We can find innumerous reports which show that the Prophet wished for a life of modesty and thankfulness to Allah for whatever He provides instead of leading a rich, prosperous life. The prophet used to make the following dua (invocation): "O Allah, keep me in the company of the poor. Let me die in poverty, raise me with the poor on the Day of Judgement." Aisha once asked the Prophet, "Why do you ask to be kept in the company of the poor, let you die in poverty and raise you with the poor?" Rasulullah replied, "The poor will enter the Paradise before the rich." After a pause he added, "O Aisha, never turn a needy person away from your door. Give him something, though it be only a piece of a date. Respect the poor and love them in spite of their poverty. If you bring the poor and needy closer to you, Allah will bring you closer to himself." Rasulullah replied, "The poor will enter the Paradise before the rich. O Aisha, never turn a needy person away from your door." The following hadith of Allah's Apostle gives us the broadest perspective on the issue of education of propriety, good morals, virtues and knowledge within the family: " All of you are shepherds and each one is responsible for his flock. A leader of a people is a shepherd and responsible for them. A man is a shepherd over his family and is responsible for them. A woman is a shepherd over her husband's house and his children and she is responsible for them..."
We can see a great deal of this dimension of education in the Prophet's relationships with his children.. He raised them on Islamic principles and continued to look out for them after their marriages too. He not only took care of some of their material needs, he was also there for their spiritual needs. When it came to this, he did not make any difference between his own children and his stepchildren. He treated them with the same love and compassion and drew their attention to whatever was necessary for their education. Once he saw Umar, the son of Umm Salamah from her prior marriage to Abu Salamah, eat from all sides of the dish and said to him: "O boy! Mention the Name of Allah and eat with your right hand, and eat of the dish what is nearer to you". When in Madinah, Allah's Apostle used to go to the house of her daughter Fatimah and his son-in-law Ali every morning after he woke up for the morning prayer to wake them up, which is only a small portion of his affection and care for them even after they became adults and got married. The Prophet shared all the worries and happinesses of his children not only as Allah's Apostle, but also as a human being, as their father. Once his son-in-law, Abu'l As, the husband of his eldest daughter Zaynab, was taken by the muslims as a prisoner of war from the side of polytheists at the Battle of Badr. While the prisoners of war were being released in return for a ransom, Abu'l As wanted to offer his wife's necklace to be released too. When the Prophet saw this necklace which was a wedding gift to Zaynab from Khadija, he became very sad and told his companions: ‘You can either take it or leave it.' When they saw how upset he was, the companions of the Prophet gave the necklace back to him. In what progressed later, the Prophet asked Abu'l As to bring his daughter to Madinah. Abu'l As kept his promise and brought Zaynab to Madinah. The Prophet was very glad that Zaynab could come and appreciated his son-in-law on this one. Again, similar to this, the Prophet could not see or hear from his other daughter Ruqiyyah, who married to Othman and migrated to Habeshestan with him, for a very long time. He was rejoiced when a woman came to him and told him that she saw them and that they were fine. His shedding tears by the side of the grave of his other daughter, Umm Kholsom, is another one of his sad and happy moments that we can find in sources. There are many other similar instances with his daughter Fatimah, his son-in-law Ali and his grandchildren Hasan and Hussain in sources of hadith and others. To sum up, the family life of Allah's Apostle is an exemplary one in all respects. The principles he followed in his family life are timeless and have lost nothing of their significance over centuries. What we see in the family life of the Prophet is the best model for peace and happiness in this smallest unit of society, which is also what ensures the peace of the whole of society. Relationships with relatives make up an important part of the relations within social texture which spin from one's immediate family into a much larger group. It is a well-known fact that Prophet Muhammad always had a respected place in his society both before and after his prophethood. The respect others had for him was the fruit of his good relationships with the tribe of Quraysh to which he belonged and in which he lived. He also had a close, loving relationship with his aunts and uncles. We can read between the lines of various reports of his life to find out information that supports these facts. Such a report from his life is the one about the first time the Prophet received divine revelation. It tells how Khadija calmed him down when he went to her scared and worried. She told him: "Never! By Allah, Allah will never disgrace you. You unite your relatives and you bear the burden of the weak (of our society). You help the poor and the needy, you are honorable to all guests and you bear harm in the path of truthfulness." Allah's Apostle set an example of solidarity among relatives and of helping one another when he took his cousin, Hadhrat Ali, under his protection and raised him. According to the historical reports, the Prophet's uncle, Abu Talib, had many children and he could not afford to support all of them. The Prophet took Ali under his responsibility and raised him to alleviate his uncle's burden. Abbas, too, took another son of Abu Talib to raise so he could help his brother. The Prophet continued his good relationship with his relatives after his prophethood by inviting them to Islam. In fact, he first started his call to Islam from his relatives before he appealed to all people. When the ayah of "And warn your nearest relations" was revealed, Allah's Apostle climbed on top of the hill of Safa in Mecca, called out for the chiefs of the branches of the tribe of Quraysh and invited them to Islam. According to a report narrated by Ibn Abbas, Allah's Apostle was in the middle of the lineage of the tribe of Quraysh and therefore had relations with all the branches of the tribe. This was the reason why he first started his invitation to Islam with them. He requested nothing in return for his invitation. He only asked them to keep their good relations and not be unfair. After his prophethood, the Prophet started to call people to Islam and he always had the support of those of his relatives who believed in Allah and him. During the first few very difficult years of his call to Islam, the Prophet's uncle, Abu Talib, protected him from the oppression and cruelty of the polytheists. Again, his uncle Hamza's support of him went as far as his being martyred at the Battle of Uhud. Abbas, another uncle of the Prophet, believed in him at a later time and remained by his side for all of his life. "Worship Allah without joining him none in your worship, pray, give zakat (obligatory charity tax) and maintain good relations and ties with your kin." Along with examples of solidarity of all kinds that the Prophet had with his relatives, we also see in his life that he emphasized the importance of not breaking relations with one's relatives, in fact he preached this to all muslims as a principle. He gave the following advice to someone who asked to tell him of a good deed that could take him to Heaven: "Worship Allah without joining him none in your worship, pray, give zakat (obligatory charity tax) and maintain good relations and ties with your kin." He warned people that those who break their relations with their relatives would end up in Hell while he gave the good news for those who maintain these relations that they would have ample blessings from Allah. The following report provides us with a clear framework in terms of the desired relationships with one's relatives. Prophet Muhammad said: "Treating your kin with the same kindness they treat you with does not count as protecting and looking out for them. The person who truly protects and looks out for his kin is the one who keeps benefiting them even when they break their relations with him.". The Prophet's warning on not breaking one's relations even with relatives that do not believe, is also worth mentioning here. In some other reports, we see that the Prophet used the expression of ‘my Ahl ul Bayt' for his close relatives and he protected them from some unpleasant actions. The Prophet's uncle, Abbas b. Abdalmuttalib narrated: "A group of people from Quraysh used to stop talking amongst themselves when they saw us. We told about this situation to Allah's Apostle upon which he said: What is the matter with those who stop talking when they see someone from my Ahl ul Bayt? I swear by Allah, that a servant(of Allah) shall not be a faithful believer unless he loves my Ahl ul Bayt on account of his love for Allah and my Ahl ul Bayt's closeness to me." In another report quoted in Muslim, the Prophet called the attention of muslims to his Ahl ul Bayt and commanded them to observe their rights. The infamous ‘thaqalain' hadith narrated by Zayd b. Arkam not only involves the Prophet's advice to muslims on his relatives but it also explains that all of the close relatives of the Prophet are among his Ahl ul Bayt. The related part of this fairly long report is as follows: "O people, know that I am only a human being. The time draws near when I will be called (to the next world), and for me to accept Allah's invitation. I am leaving behind among you, two most precious things: Allah's scripture which contains guidance and light, don't let it go and hold it tight." After this, he added "and my Ahl ul Bayt who are my family members. Beware how you behave towards these. ", which he repeated three times. In the following part of the report, Zayd is asked about who are Ahl ul Bayt and he informs that they are the household of Hadhrat Ali and the households of Aqil, Jafar and Abbas, who are all close relatives of the Prophet. Allah's Apostle reminded muslims, in many other reports, of the importance of his Ahl ul Bayt and muslims embraced the Prophet's relatives with a similar love and respect they had for him. The Prophet's relatives were prohibited from accepting zakat and a share of booty was allocated for them on a command of the Quran. The Prophet gave away 1/5 of 1/5 of the booty to his relatives. When he did this, he included Banu Hashem and Banu Muttalib while he excluded Banu Umayyah. His practice shows us that the Prophet did not forget the unbelievable oppression and cruelty of Banu Umayyah towards himself and other muslims and for this reason he did not make them a part of this allocation. The happinesses of his relatives made the Prophet happy and their worries upset him. Once when he was with his companions in the mosque, Hadhrat Ali came in and looked for a while for a place to sit. Allah's Apostle looked around at the faces of his companions in a way to imply that he wanted them to make room for Ali. Hadhrat Abu Bakr who was sitting to the right of the Prophet noticed what was going on, moved over to the side and called Ali: "Come here Aba Hasan". This made the Prophet very glad and he thus complimented Abu Bakr: "Only the ones with virtues can know the virtues of people with virtues." To sum up, the Prophet was very sensitive about relationships with one's immediate family and relatives. After a phase of education and illumination of his own family and relatives, he continued to treat them with love and respect. The life of the Prophet is seen as a model by muslims in this sense like every other aspect of his life and those who follow in his footsteps always work towards the creation of a peaceful society based on good relationships within family and among relatives. Please type '928' into this field. Aswr. Jazakallah for released the information so important. jazakallah khaira ahasanul jaza.ameen ya rabbul aalameen.